Great as a table centerpiece or other house decoration, this tree is a pretty yet thrifty decoration. We collected our pinecones from outdoors, so all we needed to buy was the foam base and some spray paint to decorate it! Begin gluing the pinecones to the cone. It is okay if there is a small nub sticking out of the base of the pinecone as it will help hold the pinecone to the foam. 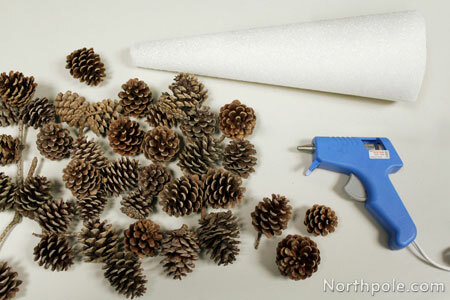 Apply a dab of hot glue to the base of the pinecone and immediately stick near the base of the foam. Note: We find it helpful to sort the pinecones by size. Glue the larger ones at the base of the foam and smaller ones near the top. Glue a ring of pinecones around the base of the cone. Continue gluing pinecones close together. Continue until you get to the top. 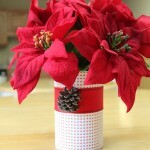 If necessary, break off a few petals of the pinecones so that they fit close together. Glue one pinecone on top, standing upright. Frosted tips: Place a small amount of white paint onto a paper plate. Lightly dip the tip of paintbrush in paint. Gently pass the brush over the tips of the pinecone petals. 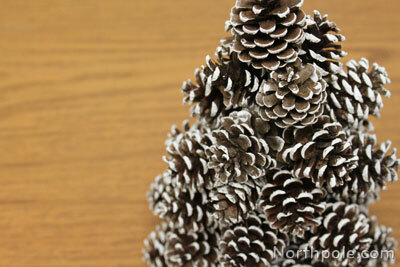 This will give it an appearance of snow on the pinecone. Set aside and let dry. Repeat for each pinecone. 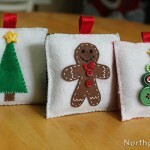 Glittered tips: Place a dollop of glue on a paper plate. Apply glue to the tips of the pinecones. Sprinkle with glitter. 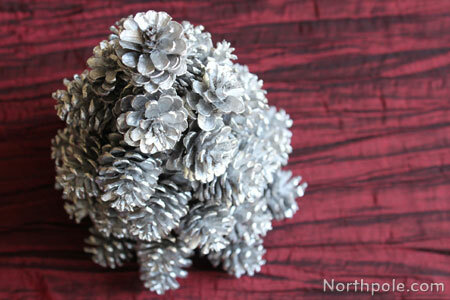 Silver tree: Paint your pinecone tree with silver spray paint. If your pinecones are damp, place a single layer of pinecones on a baking sheet and place in oven at 200–250° Fahrenheit for about 30 minutes to dry any excess moisture. Remove pinecones from oven and let cool for 30 minutes. 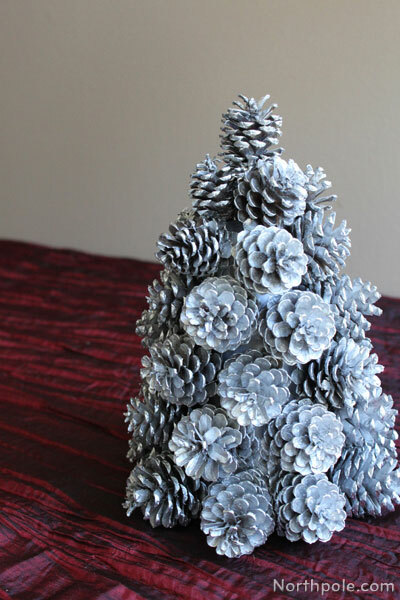 We made a kid version of this craft, so parents and children can make festive pinecone trees together! It is tailored for mini-me’s and is perfect for little crafters. Click here for the instructions.